I have mentioned before how much I love Chicken Cordon Bleu and any variation of it. 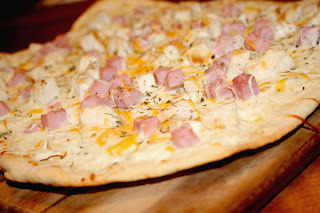 Once my husband brought home some leftover pizza from a family event I couldn't go to and I tried some Chicken Cordon Bleu pizza I was hooked. I don't eat it that often because while my husband likes it, he's much more of a pepperoni fan, but occasionally I breakdown and have it. It's Chicken Cordon Bleu and pizza - what's not to like? Top the prepared pizza dough with cheese sauce, then top with chicken, ham and pizza cheese mixture. Sprinkle with Italian seasoning. Bake in a 450 degree oven about 10-20 minutes, depending on the dough recipe used.